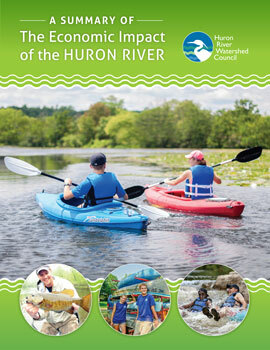 In 2016, HRWC commissioned a unique study to measure the economic impact of the river on local communities, focusing on Huron River Water Trail activities and the value of natural systems that maintain a healthy, clean river. The Huron River contributes enormous benefit to the local economy. That’s one of the key takeaways from research conducted by a research team with Grand Valley State University lead by Dr. Paul Isely, associate dean. Their work, supported by HRWC and the RiverUp! 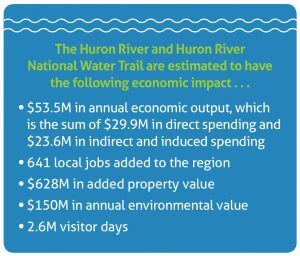 initiative, represents a significant step forward in quantifying the economic value of the Huron River corridor and the Huron River Water Trail, a designated National Water Trail. The study provides robust baseline information about who’s using the river and trails along it, how the downtowns and businesses near the river relate to it, and how the value of maintaining the river corridor’s natural features can be monetized.  As a result, HRWC and its partners can make more targeted investments, track changes over time, and have another tool for engaging new partners. 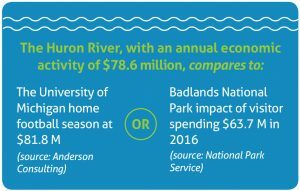 The team followed a two-part approach to understanding the value of the Huron River: measure the river’s economic impact using visitor and business surveys; and assess the positive benefits of the Huron River watershed to people, also known as ecosystem services. The Huron River supports recreation, tourism, and business activities that greatly support the local economy. The majority of this spending is driven by outdoor activity around or near the water. The second part of the study estimates the ecosystem value of the Huron River. Nature provides vital contributions to economic and social well-being that are often not traded in markets or fully considered in land use, business, and other economic decisions. In the case of a river, these contributions include protection against erosion and flooding, habitat for diverse birds, fish, and mammals, and cultural and aesthetic benefits that come from people’s interactions with nature. Measuring the economic impact of the Huron River will benefit local partners as well as similar placemaking efforts and water trails around the country. A 2015 survey of impact studies for water trails by the National Park Service found only three reference studies. Water trails in Michigan and around the country through the National Water Trails System are ready to learn from findings on the Huron River Water Trail. Since it began in 2012, RiverUp! has contributed more than $2 million in private and public investments to restore and protect the Huron River, revitalize community waterfronts, and increase water-based recreation for all. RiverUp!’s work is leveraged by an additional $40 million in riverfront improvements by partners over that time. This new report provides HRWC and its RiverUp! partners with reliable information on the value of these investments compared to the river-based economy.